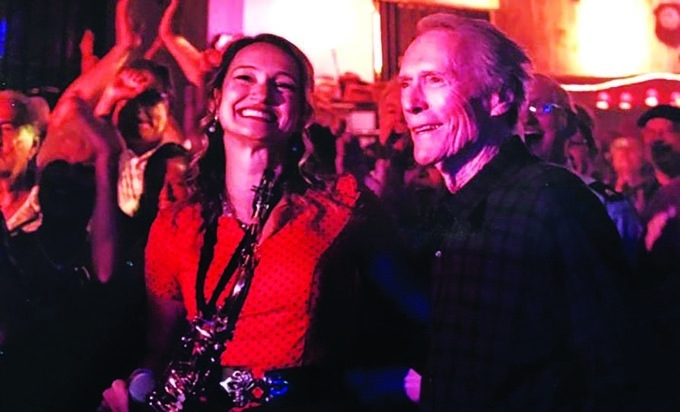 Local favorite, musician Mollie B, recently appeared in the Clint Eastwood movie, "The Mule." Mollie said, “Mr. Eastwood watches the Mollie B Polka Party on TV, and according to the folks at Warner Brothers studios, ‘He is a Mollie B fan.’ Mr. Eastwood wanted to know if I would be in his upcoming movie as ‘Mollie B’ along with my band. The scene was a grand re-opening of a VFW with Clint Eastwood’s character. Not only would I get to sing and play in this scene, Ted Lange and I had the opportunity to submit original songs for the polka band to play in this movie scene. Locally, Mollie B. fans raved about the movie. “I saw it four times,” said Rodney "Peanuts" Esser, head custodian at Park Elementary, and one of Mollie B’s biggest fans. Mr. Peanuts, as he’s called by students at the school, shared his story about how a hundred friends of Mollie B had been invited to be extras in the movie, and that he had known most of them, and was thrilled to see them on the silver screen. “They were shooting during the last week of school, and, of course, I couldn’t make it,” Esser said. The polka scene was shot in one day after many takes. “We did the whole scene maybe eight or 10 times, and then he changed it, and then we did it that way multiple times,” Mollie said.